Check out all upcoming CHOSUN events on the events page of the CHOSUN website! 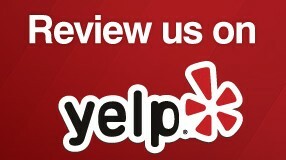 Please visit the updated and improved CHOSUN Yelp page! Chosun Taekwondo Academy celebrating 20 years! I am a big fan of tofu. Back in the day (the 1970’s) I lived in a commune called The Farm in Summertown, Tennessee. We were 1200 folks committed to the idea that the Soybean was going to save the world!! We would make fresh tofu every day for all the families. It was an amazing operation and experience. So I am always on the lookout for any new way to prepare tofu. Now that I have embraced Korean cooking here’s a recipe that I love. Dobu Jorim. Dobu Jorim is a very popular Banchan (side dish) in Korea. We ate it a lot on our adventures to Korea. Koreans pack this dobu in their Bento lunch boxes all the time. It’s inexpensive and excellent eaten hot or cold. I prefer to eat it hot with a side of rice and Gim (seaweed). One of my favorite websites is Omma’s Kitchen. I learned how to make this wonderful dish from her fabulous Facebook page . So here is my take on Omma’s Dobu Jorim. Kamsamida Omma!! Add 3 Tbs vegetable oil to a large saute pan and fry the tofu till golden brown on each side. This takes a while so be patient, don’t keep flipping the tofu back and forth. Let it sit till nice and crispy. 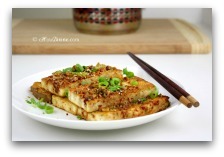 Transfer the tofu to a lidded pot and set over medium heat and pour the sauce over the tofu and gently stir till coated. Cover with lid and steam for 5 minutes. Serve with rice or just keep in the frig for a quick snack. I have discovered another Korean Chef on You Tube, her name is Seonkyoung Longest. Her recipes are excellent! !